A grand staircase will bring a sense of elegance to your home or office. Current trends for custom stair systems encompass various elements of modern style, with stainless steel and glass as a clean and sleek option. If you are planning to incorporate a staircase into your home or business, curved or straight, glass and stainless steel modern stair railing is an elegant design choice creating a sense of sophistication and style. This curved commercial staircase is just one example of modern trends with elegant design elements. The double open-curved stair with open-rise treads keeps the staircase from feeling closed in, helping the entire space feel much larger. With a stainless steel and glass balustrade, the elegance of the entire staircase really shines through. The handrail and newel posts are stainless steel meshing beautifully with the custom curved glass panels to provide the maximum in quality and grace for any kind of commercial location. Both glass and stainless steel provide many reasons to be the right choice in modern staircase design. 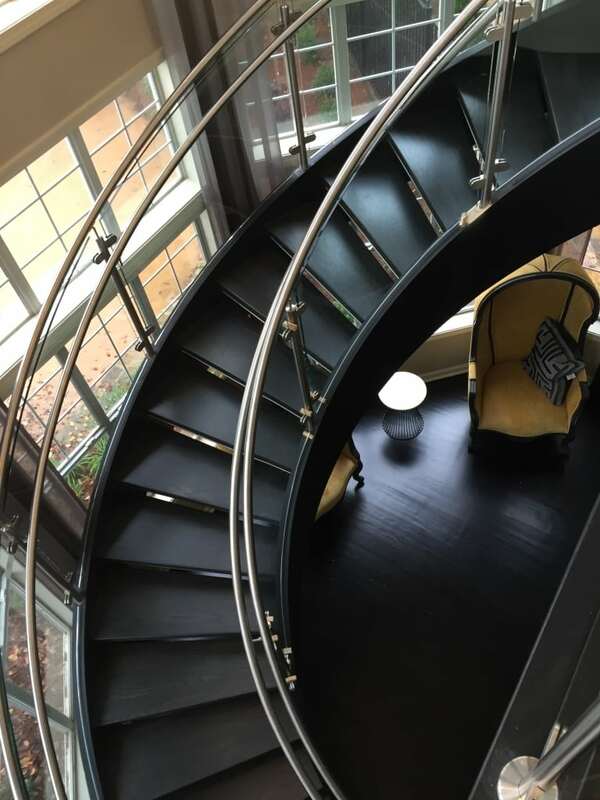 Here are some of the great features you will see when you select glass, stainless steel, or a combination of those products, to create an elegant staircase in your residential or commercial space. A glass handrail system provides a modern decor with a great theme, whether you are in a residential home or a commercial location. Glass gives a contemporary appearance with clean lines. It can be a visually stunning component of any staircase, the highlight of the overall design of any modern stair railing. It provides a clear line of site that reduces distraction and helps the space feel more open, creating beauty and functionality along with unobstructed views. With exquisite transparency a modern staircase design using glass will showcase natural elegance for years to come. Incorporating stainless steel into your custom stairs design provides a modern, fresh style with contemporary sophistication. In addition, it is a high-quality, extremely durable material that has a sleek design and alluring appeal. The weldable building material is custom-made to be aesthetically pleasing to be used in nearly any kind of staircase application. 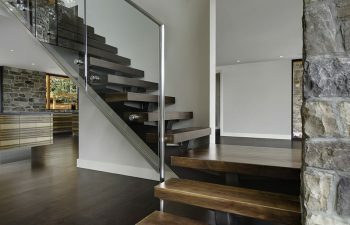 Why Glass and Stainless Steel Stairs? Glass and stainless steel are the perfect combination for a strong, durable structure that provides modern staircase design while still remaining simple. The combination is versatile and can be easily adapted to various locations. With a combination of industrial elements and a sense of clarity, using glass and stainless steel modern stair railing makes an architectural statement. Both materials can be configured to meet your design needs, creating a work of art in your home or commercial space. Visit our modern railing design gallery for additional details and pictures on our custom staircase projects. From inspiration to installation our team is committed to designing and building the highest quality stainless steel and glass railings. Our reputation speaks for itself and client satisfaction is our highest priority.